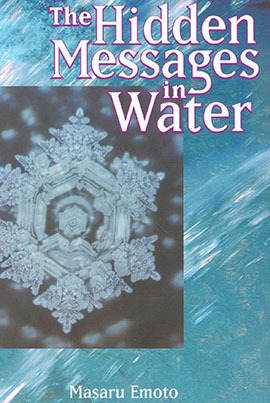 “The Hidden Messages In Water” is written by Masaru Emoto, a man who insists that water crystallizes differently based on the “energies” that surround it. He claims (fraudulently, of course) that if you mentally project fear or other negative emotions onto a test-tube of water, it will freeze into a grey lump rather than into an elegant crystalline snowflake. His title of “Dr.” comes from a certificate of “Doctor In Alternative Medicine from Open International University,” which is exactly as legitimate as it sounds. The sequel, “The Shape Of Love”, insists that humans can predict future events by looking at ice crystals under a microscope, divining their shape to find such specific prophecies as “despair” or “hope.” You can tell it’s real because he used a microscope, and they don’t let just anyone have one of those.